alaTest has collected and analyzed 293 reviews of Samsung BD-H8500M. The average rating for this product is 4.0/5, compared to an average rating of 4.6/5 for other products in the same category for all reviews. We analyzed user and expert ratings, product age and more factors. Compared to other products in the same category the Samsung BD-H8500M is awarded an overall alaScore™ of 89/100 = Very good quality. It is amazing value for money considering all its features. Its presentation of recorded programmes is clumsy and not user friendly. Some tasks require too many button clicks to complete, deleting a recorded programme for example. It works. 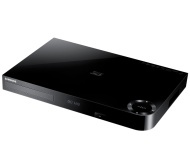 A Blu-ray player, a twin tuner HD PVR and plays a god range of video files through USB or streaming. The user interface is a bit cumbersome but it works. It took some getting used too as it had no printed instructions . The product did not work very well with our series 6 Samsung TV plus the instructions were a waste of time. Records two things at once, while watching something recorded previously. So far, everything recorded has worked well. There are many feature that I have not explored yet.